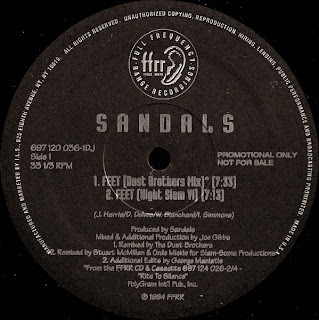 This is the 1994 FFRR/Polygram Records US 12" release for the remixes of the track by Sandals. The A side features two remixes by some of the finest UK producers. The first mix was constructed by the duo formerly known as The Dust Brothers. Their mix is a chunky beat driven funk-fest that pushes bass heavy rhythms and wild synth patterns to make this a memorable remix effort. The second mix was done by Glasgow, Scotland techno duo Slam. The remix is one of two done by them, but the only one released on vinyl. Starting off slowly and building into a frenzied pit of spastic sound, this mix is the most aggressive sounding of all that were commissioned for the release. 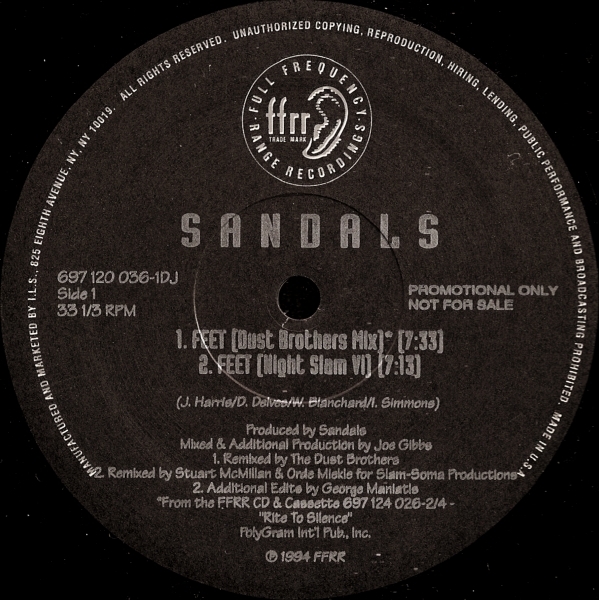 The B side remixes were both done by members of the Hardkiss "family". The first is credited to Next School (aka Scott Hardkiss) and is without a doubt, the most interesting of the cuts released on this 12". With a triple BPM change, this is both a fun and funky tune and a workable DJ tool to switch up mood and/or tempo. The second remix was put together by both Robbie Hardkiss and Scott Hardkiss and is closer to what the predominant sound of San Fran was at the time. With live guitar laid over the loose percussion patterns and sounds that flutter in and out of the mix, it definitely has the "west coast house sound" heartily infused. All four mixes are here for your listening pleasure. great blog. added to the Acid Ted blog.